Small children can get bored easily, so combining a walk outdoors with something that's both fun and educational is sure to be a winner. Nature observation walks can be fantastic learning experiences for toddlers and even babies can enjoy the ride, provided they have plenty to look at and keep them busy along the way. 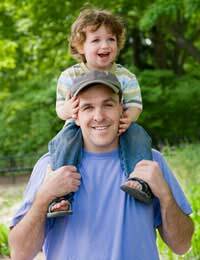 It's best to plan a short walk of an hour or less, depending on your child's age and stamina level. The easiest way to get them interested and excited is to involve them in every aspect of the planning. Depending on where you plan to go, that can mean packing a backpack with various items, plotting a route and talking beforehand about what to look out for. To plan a route, get out some paper and crayons and make a rudimentary map. An example is: to the playground, around the corner, past the newsagent's, through the tiny field and then back. Draw images along the map they can follow easily that represent certain landmarks, and let them cross off where they have been. Next, decide what you hope to see on your walk. Would you like to hunt for three ladybirds, two spiders and another insect, for example, or do you hope to find six leaves, a pinecone and three shiny stones? Keep your child's interest in mind and get a small bag ready where they can collect their treasures. Next, pack the backpack. You may want to include a water bottle and a small snack, such as a few biscuits and an apple. If it's a sunny day a bottle of suncream may be a good idea, as well as a sunhat and small cloth. Your children might also want to take some treasures of their own, such as a compass or cuddly friend to accompany them, and a bucket or sack for their nature “collection”. Once you begin your walk, don't limit yourself to the big picture. Instead of just pointing out a tree as a single object, observe more carefully. Upon closer inspection, you may notice a spiderweb, a bird building a nest, a cluster of unusual leaves or bark or even a wasp's nest. If your curiosity is piqued – and that of your child's – this could lead to more in-depth observations, and could even mean future purchases of field guides, insect bibles and other publications of interest. Listen also to the sounds that nature makes. The world is not only a visual one, it supplies us with a wealth of sounds, smells and physical sensations as well. Involve your child in looking under the surface and actually feeling what the world can provide. Sensory awareness is a wonderful thing. Most kids this age also love to count, so you can simply have them keep track of the number of things they see en route outdoors, such as big trees, cows, blades of grass for the more serious, etc. You can also encourage them to start their own collection of items that occur in nature, having them carry a bucket for special rocks or leaves. Letting your children know which things are okay to pick (wildflowers) and which aren't (your next-door neighbour's prize roses) is also an important lesson for them to learn. Once you return home, the walk doesn't have to end. Depending on your child's age, he or she may enjoy drawing a picture of what they saw on the walk, making a scrapbook that involves gluing down sticks and leaves, or even carrying out more research about what they have seen. Nature walks can be interesting and enjoyable. Just because you don't own a little place in the country doesn't mean you have to limit yourself to walks only on special holidays. Visit your local park, the woods or even a corner of your neighbour's back garden (with their permission). The most important rule is: have fun!